Google Drive is one of a Swiss Army knife comprising some of the best productivity tools to use in your instruction. Besides being a cloud based storage system where you can save and access all of your digital content, it also embeds handy applications enabling you to write documents, design presentations, create spreadsheets, and make beautiful drawings. It offers several collaborative features to enhance team work and facilitate collaboration on joint projects. Our Google Drive section here in EdTech and mLearning provides you with the necessary resources to help you tap into the educational potential of Google Drive, check it out learn more. 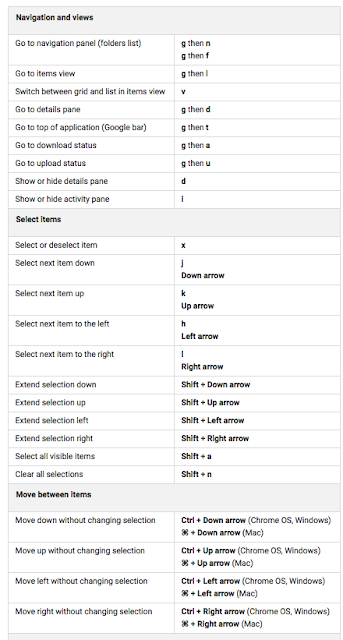 The purpose of our post today is to share with you this updated chart featuring some interesting keyboard shortcuts for Google Drive on the web. You can access the full list from this page or you can display it in your Google Drive by pressing on Ctrl + / (Chrome OS, Windows) or ⌘ + / (Mac). Click on the image below to access to the full list.